Looking for a black and white filter? Despite all the advantages of color photography, monochrome photos remain popular. No wonder, as they have a particular distinctiveness and depth. Black and white images make us pay more attention to the shape of objects and their texture. In addition, greyscale is a good way to restore color photos with defects. If your photos were taken in a poor lighting, a black and white converter will help you fix the flaws! In fact, with the help of a black and white filter, you can quickly improve almost any photo. Whatever the viewing point or viewing angle of your image, or if you forgot to set the black and white mode while you were shooting, don't worry! 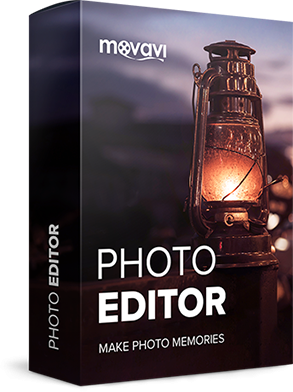 There is software that’s just right for fixing it: Movavi Photo Editor will help you make a picture black and white. Download the appropriate version of the program and follow the step-by-step instructions below. Download the installation file, then click on it twice. After the installation starts, follow the on-screen instructions to complete the process. 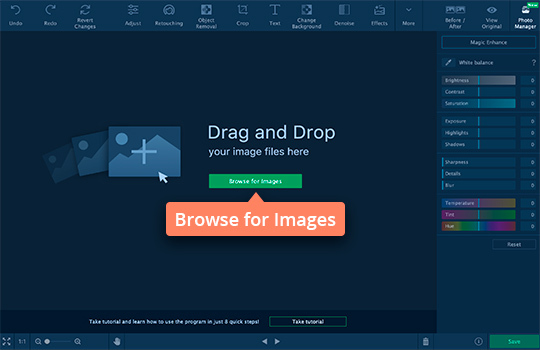 Hit the Browse for Images button to open the file you want to improve. Alternatively, you can simply drag and drop the picture into the working area. 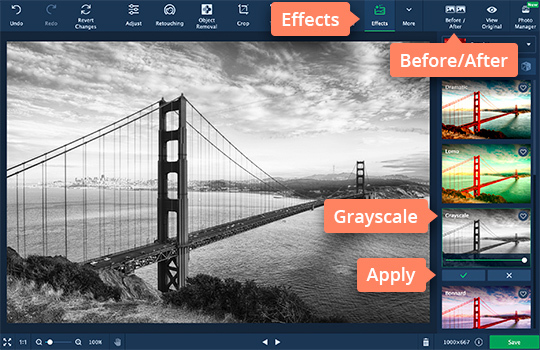 To make the photo black and white, switch over to the Effects tab and choose Greyscale from the list on the right. To adjust the intensity, move the slider to the left in the selected area and then click the Apply button. To compare an edited image with the original, press the Before/After tab above the Effects list. Congratulations! Your picture is now black and white. Сlick the Save button to save the photo to disk. Now you know how to apply a black and white filter to your photos. 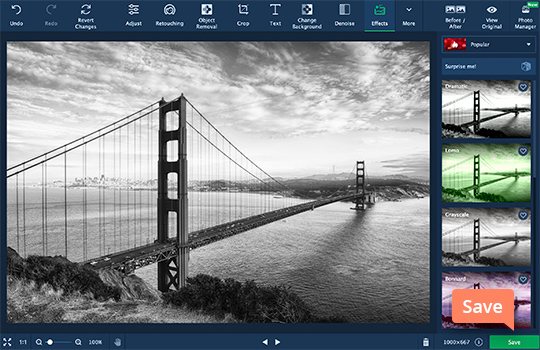 Convert any image to greyscale in just a few clicks!